Summary and Definition: The Cherokee were a large and powerful tribe who originally moved from the Great Lakes region to the southern Appalachian Mountains and lived in a massive area now distributed among the states of western North and South Carolina, northern Georgia, southwest Virginia, Tennessee, Kentucky, northern Alabama Alabama, Mississippi, and the west of Florida. The Cherokee people were hunters and farmers who grew the staple crops of corn, beans and squash. What language did the Cherokee tribe speak? What was the lifestyle and culture of the Cherokee tribe? The Cherokee tribe were unlike the other 'civilised tribes' not only in language but also in their ancient history. The Cherokee originated in the north and gradually moved southwards establishing settlements across the regions once inhabited by the Mississippian culture of mound builders. In all other respects the Cherokee assumed the same lifestyle as other tribes of the southeast region. They established a vast number of fortified towns consisting of 30 - 80 wattle and daub houses together with a large meeting house. The people were both hunters and farmers. They raised the "three sisters" crops of corn (maize), beans and squash and celebrated the Busk, or Green Corn festival. The Europeans brought devastating unknown diseases and wars to the people. The newcomers also brought many new ideas and the Cherokee adopted American-style clothes and log cabin styles of houses. In 1821 Sequoyah aka George Gist (c. 1770 - 1843) invented the Cherokee Alphabet, using symbols for letters. The Indian Removal Act of 1830 led to the forced removal of the Cherokee on the Trail of Tears. Following the War of Independence the 'civilizing programs' began. The Cherokee tribe became known as one of the Five Civilised Tribes who also included the Creek, Choctaw, Chickasaw and Seminoles tribes. The culture and social structure of the Cherokee people included a judiciary system, a written constitution, two legislative chambers and a public school system. The Indian Removal Act of 1830, signed by Andrew Jackson, started the removal of the Five Civilised tribes, including the Cherokee, along the infamous Trail of Tears from their homelands to reservations in Oklahoma. Nearly 4000 Cherokees died on the Trail of Tears from malnutrition, disease and exposure. The Cherokee refer to the journey as 'Nunna daul Isunyi' which translates to �The Trail Where They Cried�. For additional information refer to the Trail of Tears Facts and the Trail of Tears Map. The above picture depicts Col-lee, who was a a Band Chief of the Cherokee. It was painted by the famous artist George Catlin (1796-1872) at Fort Gibson in 1834. The chief wore a blue colored matchcoat over a white shirt. He also wore decorative red sash around his waist. His turban style headdress was worn by many of the southeastern tribes and made with strips of calico cloth wrapped around his head like a headband or turban. The Cherokee are people of the Southeast Native American cultural group. The geography of the region in which they lived dictated the lifestyle and culture of the Cherokee tribe. What clothes did the Cherokee wear? The Cherokee men originally wore breechcloths made from deer skin or bark fabric of the type depicted in the Green Corn Dance picture. Leggings and moccasins were also worn. Chiefs wore long, full cloaks made of feathers and feather caps. The men shaved their heads, leaving a a scalplock)which they allowed to grow long. They painted and tattooed their bodies and faces. The Cherokee women wore a knee-length, wraparound skirts, also made from a bark fabric or deerskin. A poncho style blouse was later introduced. 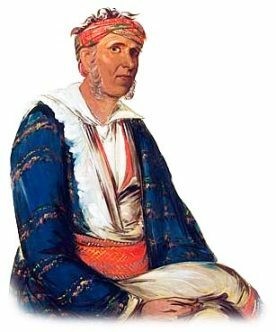 The above picture of Col-lee shows how the style of clothes worn by the Cherokee changed in the late 1800's. Clothing was were greatly influenced by the Americans and the availability of trade cloth. What did the Cherokee tribe live in? The Cherokee tribe lived in wattle and daub houses made by weaving river cane, wood, and vines into a framework, then coating the frame with mud. The roof was either thatched with grass or shingled with bark. As many as eight people might share this type of house. A fire constantly smouldered in the hearth, which made the windowless �asi� smoky and dark. Although the men built the houses, the women owned them. The American settlers brought new ideas and strong, sharp tools that replaced the stone axes and in the 1800's some of the Cherokee began to build American style log cabins. Rather than a chimney, a smoke hole was made in the roof. What did the Cherokee tribe eat? The food that the Cherokee tribe ate included deer (venison), bear, buffalo, elk, squirrel, rabbit, opossum and other small game and fish. Their staple foods were corn, squash and and beans supplemented with wild onions, rice, mushrooms, greens, berries and nuts. As time passed the Cherokee began raising cattle, hogs, chickens, and other domesticated animals that they acquired from Europeans. What weapons did the Cherokee use? The weapons used by the Cherokee included war clubs, tomahawks, battle hammers, knives, bows and arrows, spears and axes. Cherokees also used blowguns, generally for small game, but occasionally for warfare. The Europeans introduced muskets and then rifles. Leadership amongst the Cherokee was divided according the situation. The "red" chiefs were leaders during war and "white" chiefs in times of peace. Cherokee warriors wore tattoos and used face and body paint. Red paint for success, blue to indicate defeat or trouble, black paint meant death, and white stood for peace and happiness. Cherokee History: What happened to the Cherokee tribe? The following Cherokee history timeline details facts, dates and famous landmarks of the people. The Cherokee timeline explains what happened to the people of their tribe. 1542: The Hernando De Soto expedition encounters the Cherokee.